So! I haven’t posted a lot here lately, and that’s mostly because I have become Super Pregnant. Yes, I’ve gotten to the point that, if I walk in a room, people’s eyes widen and they say, “You’re going to have a baby soon, right?” Or they just whistle and say, “Wow!” It’s quite impressive, albeit enormously uncomfortable. I feel a bit like a superhero! Anyway, I have been working on things including a new book (I’ll post a blog about it later, but if you want a sneak peek at the cover, take a peek here,) but! In honor of me making it to full term (I’m 37 weeks and a couple of days along right now as I type! ), I want to focus on this lovely artwork that features not one, not two, but THREE very pregnant ladies! 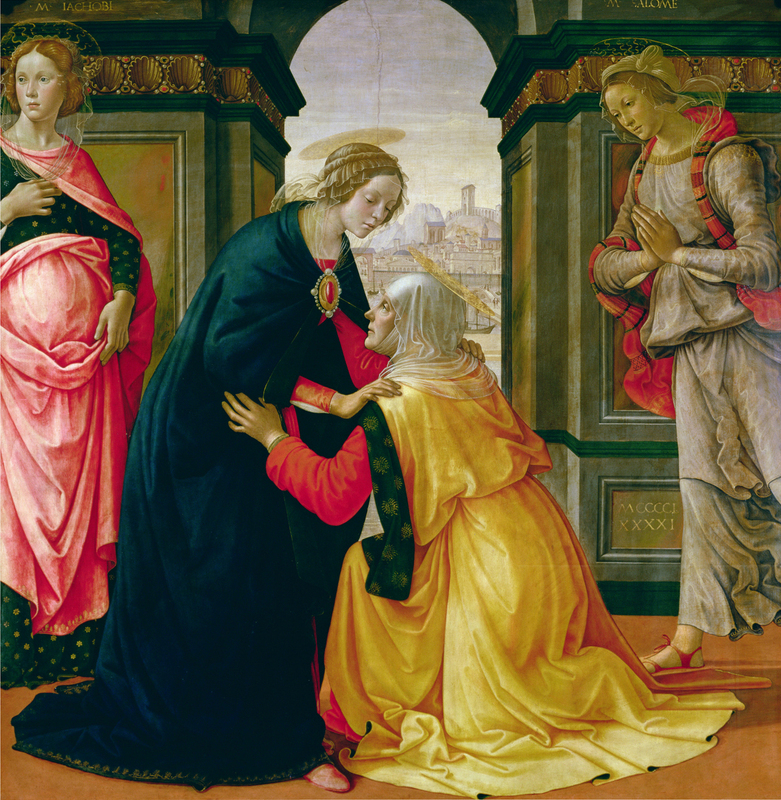 Visitation, by Domenico Ghirlandaio, c. 1491. Louvre Museum, Paris, France. From the biblical text, we don’t know what Elizabeth does when she says this — some art has her throwing up her hands in joy, other art has her embracing Mary, and yet other art has her running toward her. But in this particular piece, she is kneeling down to Mary, as Mary has in her womb the Lord. All around them are shells and pearls — symbols of Mary’s purity. And then there are the two women beside them… the one on the left looking quite pregnant! The one on the left of our Blessed Mother is Mary Jacobi, also known as the mother of James (and possibly she was also known as Mary of Clopas, though that isn’t exactly certain), and the one on the right is Salome, who is also known as the wife of Zebedee and the mother of James and John. Why are they here? Well, there is an unofficial tradition that was quite popular in the 15th century that these three Marys (the Blessed Mother, Mary Jacobi, and Mary Salome) were all sisters. And, this being a painting in the 15th century, expanded on that idea! So, Mary reaching out to Elizabeth, her kinswoman, is a family affair that they all partake in! The other thing that the three Marys symbolize indirectly is that eventually this child Jesus, whom they are all surrounding will eventually be crucified and die in the presence of these women –Mark 15:40 puts Mary Jacobi, Mary Salome, and Mary Magdalene far away while John says that Mary of Clopas, Mary Magdalene, and our Blessed Mother are closeby. But no matter the inconsistency! The point is, their very presence in the art indicates that they are there, first to welcome in the Christ, but also to remind us that, while we can admire Jesus as a mere baby, He will eventually suffer greatly, be crucified, and die. And that is a serious thought indeed. Look at each of the women’s faces! What do you think they are thinking? Which woman captures the expression toward God that you currently identify with in your own personal journey toward Christ? How does it make you feel that, in such a moment of great joy such as a pregnancy being announced, that there is a dark undercurrent of the potential for suffering? Thank you for giving us moments of great joy in our lives. Help us in these moments of great joy to grip our crosses and keep following You, undeterred. This picture is featured in my book, The Joyful Mysteries! Take a peek at it here.